This page is a tribute to some of the pioneers in accessible gaming, low-tech and hi-tech. Arguably, the very first video games to use a highly accessible control method, were created by Myron Krueger from 1969 into the 1980's. A pioneer in Virtual Reality, he created "VideoPlace" and later "VideoDesk" where any part of your body could be used to interact with the on-screen action. As you move in front of a brightly lit backdrop, a video camera captures your image as distinguished from that backdrop. Krueger's "responsive machines" turn you into a shadow on a video screen. A second camera watches another person's hands on a lit desktop (the VIDEODESK) and projects them, enormous, onto the same screen: YouTube video from 1988. "KYE was started in 1981 when Atari referred me to a teenage quadriplegic in Pennsylvania who wanted to play video games. He was depressed and his family and church were searching for something to spark his interest in living after his accident. That led me to one of the foremost rehab facilities in the country, Rancho Los Amigos Hospital, where I met several rehab specialists and Kirk Kilgour, a quadriplegic and former athlete who had played professionally for 5 years after a stellar college career, and who had been trying to get someone to build him a joystick so he could still compete using video games. We got together and I designed something that worked for him, and which the children's recreation therapy department embraced. Some of the patients were as young as 8 years old, and the motor skills and coordination needed to play the games with a mouth controller strengthened their neck and mouth muscles, the only ones they could still use. The fun they had and the joy it brought them convinced me to continue this work.". 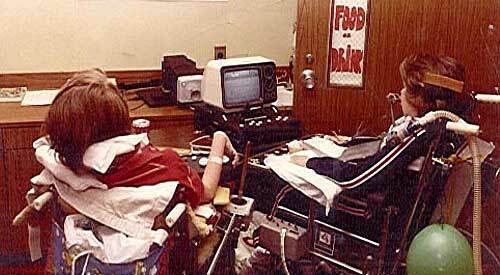 Atari were not only thinking about gamers disabled by hardware in the early 1980's, but also of gamers disabled by the difficulty level of their games. 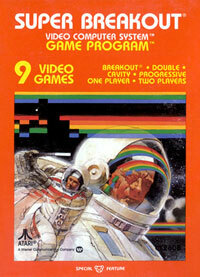 At the height of its success, Atari VCS games were adorned with a "Special Feature" bear logo and a "young children" game option. Ms. Pac-Man (1982), for example, gave you the option to select how many ghosts you wished to be up against from one to four. 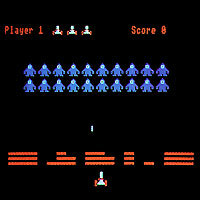 Missile Command (1981) gave options to slow the game play to a near crawl. 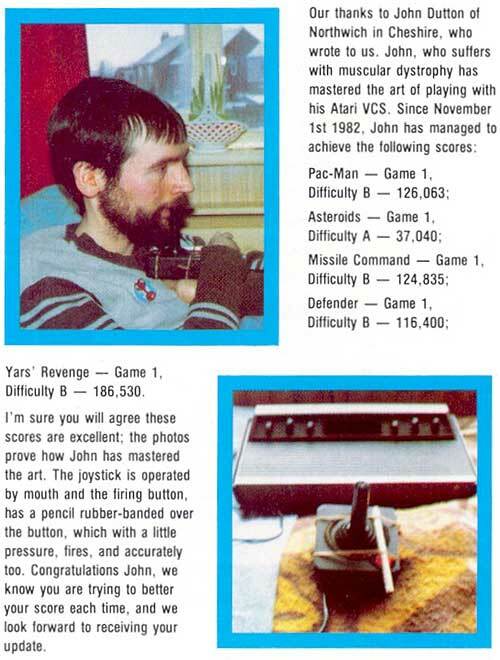 One of the first home made adaptations to a game controller I am aware of was John Dutton's accessible Atari CX40 Joystick. 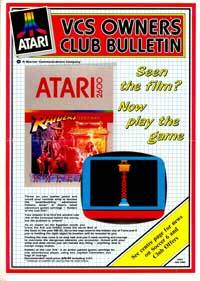 This achievement was published in the UK Atari VCS Owners Club Bulletin - Issue 24, February 1983. "Skallagrigg" a fictional book by William Horwood (1987) features a passage where the main disabled characters discover Pong in 1980. "Esther played against Tom, but the two of them were so clumsy, and the speed of the ball so relatively fast, that they had no chance of stopping it, or of scoring points against each other except by chance". In 1982, Acorn's 8-bit BBC Micro computer found favour in educational establishments around the UK. 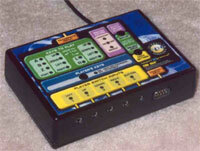 Quickly a varied range of accessible hardware and software began to appear. Of particular interest are Brilliant Computing's 1988 "Arcade Adventures" and 1990 "Arcade Challenge". These featured simple arcade games based on the likes of Space Invaders and Pong, but with options to slow game play down, and support for a variety of accessible controllers. 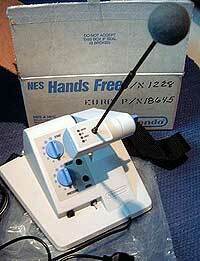 In 1988 Nintendo became the first company to officially release an accessible controller for a games console (the NES). 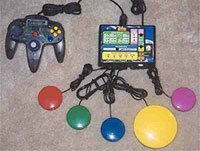 The Hands-Free controller was first announced in the Winter 1987 "Nintendo Fan Club" magazine. 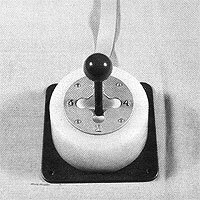 It featured a chin-controlled joystick, alongside a sip/puff switch to activate buttons A or B with normal pressure, and START or SELECT with greater pressure. "Wumpus" by QSound is considered to be one of the earliest audio games, created around 1988 and later bundled with a number of PC sound cards. This game involved shooting a strange creature whose approach was allayed in 3D sound only. Source: AudioGames.net. Michael Andrews and his company, Pathways Development Group, Inc., can be considered pioneers in games console switch gaming. 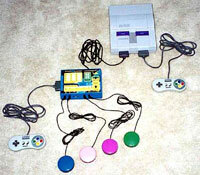 Due to their considerable efforts starting from 1993 onwards, the Nintendo NES, SNES and later N64 games consoles were made highly accessible for many disabled gamers. 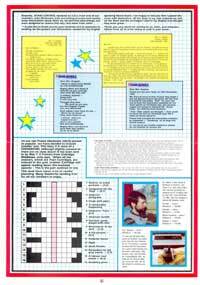 My first foray into accessible gaming was in building a disability standard switch interface for Atari and Commodore computers in 1995. 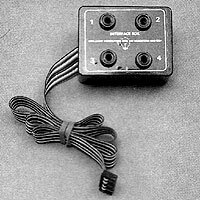 This was the first disability standard switch interface designed to be compatible with multiple platforms (to my knowledge). 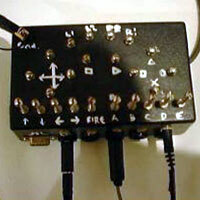 In 1996 I made my first attempt at a versatile switch accessible Playstation controller, that was still compatible with Atari and Commodore computers. 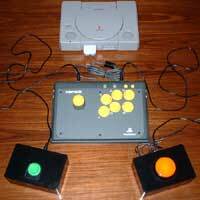 Using a mess of crocodile clip jump-leads, a simple joystick and up to five plug in switches or sensors, the Playstation became accessible to a hand full of disabled gamers in England. I soon after simplified the design by adapting a Namco Arcade Stick. 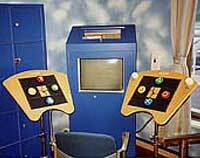 Some years later, I discovered that Namco Human Services had been working on accessible gaming themselves on a small scale since 1995. 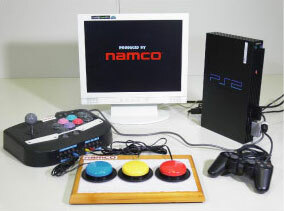 "Namco believes in using the world of play to create a space for elderly and the handicapped that removes the feeling of weakness of body or the hindrance of a handicap, and is free of any uncomfortable feelings regarding their physical limitations. That is the idea behind Namco's proposed "Barrier Free Entertainment" concept. 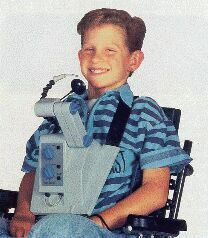 Since 1985, Namco has been developing and marketing communication devices for severely disabled children and adults such as TalkingAid and PasoPal Maruchi (Multi). In anticipation of the aging society that is almost upon us, Namco is promoting its "Namco Hustle Club Plan," which consists of the marketing of a "Rehabili-Tainment" (rehabilitation + entertainment) machine to be used for rehabilitation, but also renders the facility in which the machine is installed as an entertainment space. Through these efforts, Namco is working to create places where the elderly and the young are able to cross the generation gap to enjoy the experience of play, and make a rich life full of meaning a reality." 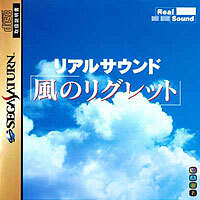 "Real Sound: Kaze no Riguretto" (WARP) was a game aimed with blind gamers in mind. It was released in Japan for the Sega Saturn, in 1997 and two years later for Sega Dreamcast. 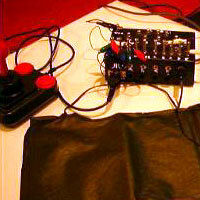 It's game play was built entirely around sound, playing like an interactive radio drama. "Zork: Grand Inquisitor" (Activision) was also released in 1997, and was the first main-stream released game to feature subtitles for both dialogue and sound effects linked to on-screen action. "Game Over! Beacuse No One Can Save The Universe" is perhaps the first ever completely inaccessible game. 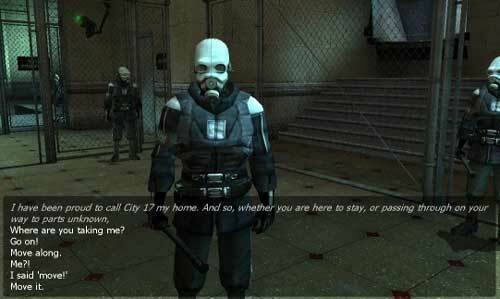 Released on-line in 2007 by UA-Games, this game was designed to make clear to gamers and developers many of the barriers disabled gamers are facing every day. Now: Since the early 1980's, there have been some excellent small scale efforts at creating or adapting hardware to make gaming more accessible. There have also been splendid games aimed squarely at disabled gamers, generally written by home-coders. However, from mainstream developers, there have been very few concessions to disabled gamers. Time for a change, do you think?